Replacing selvage on an oriental rug. This is Chad Landis, owner of River Valley Rug Cleaning in York, PA. Thank your for taking the time to learn more about us and I hope you find valuable information to find a trusted rug care professional. Working in the textile industry for over a decade and owning a carpet cleaning business, I recognized the need for high quality oriental rug care in South Central Pennsylvania. It became aware that many self proclaimed “experts” were not properly caring for rugs. In fact some trusted carpet cleaners are damaging these delicate rugs because they are not properly trained to handle these natural fibers and are cleaning them the same way they clean wall-to-wall carpeting. Until now, you had to drive out of the York area to receive authentic oriental rug care. Even the local carpet cleaners and dry cleaners had to send your valuable rugs out to a trained rug care professional. If you live in a major metropolis like Philadelphia, Baltimore, or Washington D.C. there are several quality rug cleaners to choice from. In fact, this is where your rugs end up when you drop them off at the local dry cleaners. Dry cleaners are forces to send rugs out because they can not physically place a rug in their dry cleaning machine. If a carpet cleaner is knowledgeable, they too will send a rug out for cleaning. However, most carpet cleaners can not differentiate between a $10,000 silk Hereke from Turkey and a $1,000 wool rug from Pottery Barn and will clean both as though it were a $100 nylon carpet. If you are in the York area then you have found a local hidden treasure. But because of our high level of training and expertise, we still get rugs from all over south central PA. We are the only WoolSafe Approved full service rug care studio offering authentic hand washing within a 90 minute drive of the York/Harrisburg area. Our thorough hand washing process gives us complete control of your rug during the entire process. I recall one conversation with a reputable rug cleaning facility that has a $100,000 automated rug cleaning system. When I asked them if they guarantee pet odor removal, I was literally laughed at and was told no one can make that guarantee. Now, we take the time that others simply don’t take and are able to offer a guaranteed odor removal treatment. My training goes far beyond standard carpet cleaning certification, since carpet cleaning training does not transfer to quality rug cleaning. Over several years, I sought out some second and third generation rug cleaners to learn this delicate craft. With the help of these mentors, I have become well know for providing exceptional cleaning results while protecting the integrity of the rug. River Valley Rug Cleaning by Personal Touch hold many accreditation specific to fine textiles, rugs, and wool fiber care. 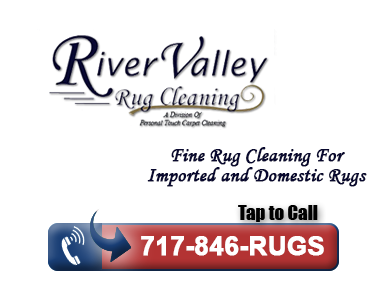 At River Valley Rug Cleaning, we are dedicated to rejuvenate and preserve your fine rugs. We love seeing woven art from around the world and are honored that our clients trust us with their treasured rugs.